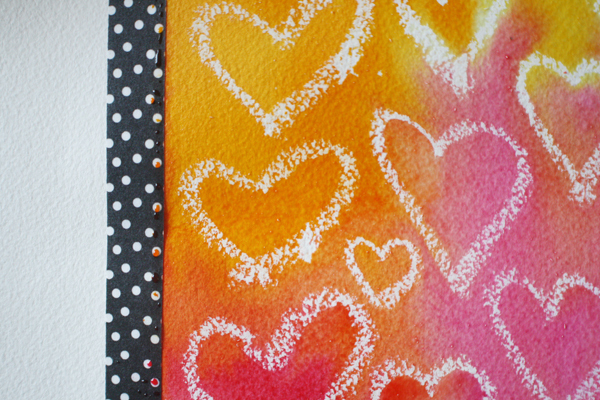 Here is a lovely watercolor, crayon resist you and your kiddos can whip up in no time. 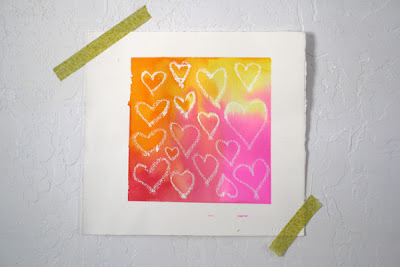 All you need is painter's tape, heavy paper (water color paper works best), a white crayon or oil pastel and watercolors. Mask out a square with your painter's tape. Have your kiddo cover their paper with drawn hearts using the white crayon or draw some hearts for your kiddo. Have your kiddo paint on water to dampen the paper and let them go to town with their paint. Stick with one color or limit your kiddo's palette to two or three that wil mix happily when they run into each other. Set aside to dry, remove tape and hang! Who Needs Blocks to Build?